*Please note colors may appear slightly different than what is represented in these computer images. *The R-CO Chimney Surround is constructed of coated, 22-ga. Steel with interlocking joints so installation is a snap. *Four brackets are provided that mount the surround to the roof. *This will not only make your home look better, it will also increase its value. 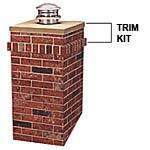 *Notes:Trim Kit is sold separately and 2 foot extensions are available when extra height is needed. *Select from ten different color patterns. *Measures 48" High x 23 1/2" Wide x 23 1/2" Deep and comes precut for 4/12 roof pitch but can easily be cut for other roof pitches.